(Newser) – Federal prosecutors have charged Theranos Inc. founder Elizabeth Holmes and former president and COO Ramesh Balwani with two counts of conspiracy to commit wire fraud and nine counts of wire fraud, reports the Wall Street Journal. They allege Holmes and Balwani defrauded investors, doctors, and patients out of millions of dollars. The indictments are the culmination of a 2½ year investigation into the blood-testing company. 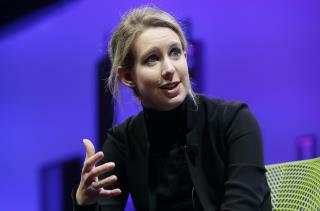 Theranos is a cautionary tale for red-hot startups. Once lauded as the youngest self-made female billionaire, Holmes sold investors on unproven claims that the company’s devices could test for conditions such as cancer and cholesterol with just a pinprick of blood, reports BBC. If convicted Holmes and Balwani face up to 20 years in prison, a fine of $250,000, and restitution, per CNN. Hey, Elizabeth, say 'Hi' to Shkreli for me. They should have hired Oz to peddle their crap. They'd still be in business.